Win Ain't Them Bodies Saints: Romance & danger | SWITCH. Set in 1970s small town Texas, Academy Award nominees Casey Afleck ('The Assassination of Jesse James by the Coward Robert Ford') and Rooney Mara ('The Girl with the Dragon Tattoo') are Ruth Guthrie and Bob Muldoon, soul-mates and criminal lovers whom prison couldn’t keep apart. Bob has just escaped jail so he can reunite with Ruth and the baby he has never met. Years before, he took the wrap when she accidently shot local sheriff Patrick Wheeler (Ben Foster, '3:10 to Yuma') in a heist gone wrong. Now the sheriff is back with a hidden agenda of his own and the two doomed lovers are about to discover romance and danger are blood kin... and the past always catches up with you. The 'Ain't Them Bodies Saints' competition has now closed. Winners will be announced shortly. Competition opens at 6:30pm AEDT on Sunday 16th March 2014 and closes at 11:59pm AEDT on Sunday 23rd March 2014. Five winners will be chosen at random on Monday 24th March 2014. To successfully win, entrants must fulfil the above entry conditions before the time the competition closes. Current members/followers are eligible to enter the competition. Only one entry per person. Only one winner per household. To be a valid winner, the entrant must not have won a prize from SWITCH within the last 28 days. Each winner will receive one Blu-ray copy of 'Ain't Them Bodies Saints'. By entering, you agree to receive occasional emails from SWITCH in the future. If you decide to unsubscribe from these updates, any further entries will not be applicable. Only Australian residents are eligible to enter. 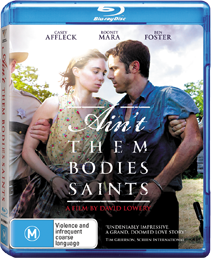 'Ain't Them Bodies Saints' is available on Blu-ray, Digital and DVD on Wednesday the 19th March 2014 from Roadshow Entertainment.